Medications often interact with other drugs, as well as certain vitamins and minerals. Coumadin is a type of medication that can help treat and prevent blood clots. Although it is often dangerous to take vitamin and drug combinations, there is no evidence that taking potassium with Coumadin will cause a reaction or increase the risk of side effects. Even though taking potassium with Coumadin is unlikely to cause problems, always discuss your vitamin and mineral supplements with your doctor, especially when taking a prescription medication. Coumadin is a brand name for warfarin, a medication that thins your blood. Your doctor may prescribe Coumadin to prevent new clots from forming, especially if you have a history of blood clots or have an abnormal heart rhythm or other problems related to your heart or circulatory system. Regardless of their potassium content, some foods may affect how warfarin works in your body. MedlinePlus recommends that you consume small amounts of mayonnaise, olive oil, broccoli, lettuce, kale and cranberry juice, while you are taking Coumadin. Potassium is a mineral that is important to the health of your bones and the way your muscles contract and function. Many types of fruits, vegetables, legumes and fish provide rich dietary sources of potassium. According to the University of Maryland Medical Center, people who consume plenty of dietary potassium generally experience a lower risk of stroke, although taking potassium supplements is unlikely to affect your risk factor. The recommended daily intake of fiber for adults is 2,000 mg per day. Although there is no evidence that Coumadin can affect your potassium levels, Heparin, a different medication for blood clots, may cause your potassium levels to increase. 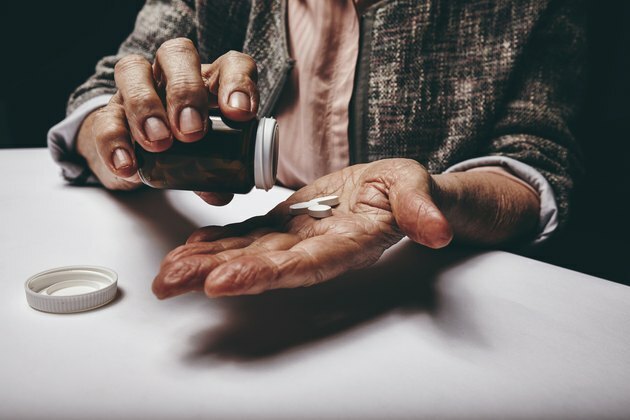 Although current medical research does not reveal a connection between Coumadin and potassium, many other medications can alter the amount of potassium in your bloodstream. These medications include antacids, laxatives, insulin, corticosteroids, diuretics and nonsteroidal anti-inflammatory drugs, or NSAIDs. Avoid taking potassium supplements or other nutritional supplements to treat a health condition, especially if you take Coumadin or other medications. Notify your doctor if you experience symptoms related to unhealthy potassium levels. These symptoms may include muscle weakness, diarrhea, nausea and abnormal heart rhythm. Let your doctor know if you experience any severe side effects while taking Coumadin, such as mental confusion, unusual stomach bulging or weakness in your legs.